Russell R. Huntington has been practicing law in Bergen County for over 30 years. Russell earned his Juris Doctorate degree from Cleveland State University in 1972 and was admitted to the Bar for the State of New Jersey in 1973. Initially employed by the Westwood, New Jersey firm of Randall, Randall & McGuire, Russell formed his own firm in 1979. He is presently the senior partner in the firm of Huntington Bailey, L.L.P. and is a well respected member of the Bar and citizen of his hometown of Westwood. He has represented many local businesses, governmental agencies, banks and individuals from all walks of life concerning an impressive array of subjects. Russell has extensive experience in probate and estate planning matters and has counseled many multi-generational family businesses on succession planning. Founding partner Huntington Bailey, L.L.P., Westwood, New Jersey. Member, Board of Trustees, Hackensack Golf Club, Oradell, N.J. Member, Board of Directors, Adaptive Sports Foundation, Inc., Windham, N.Y. Member, Board of Trustees, Westwood Chamber of Commerce, Westwood, N.J. 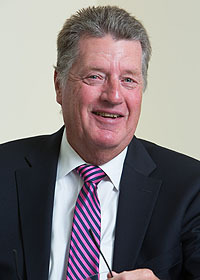 Trustee, Russell R. Huntington, Jr., Memorial Foundation, Westwood, N.J.